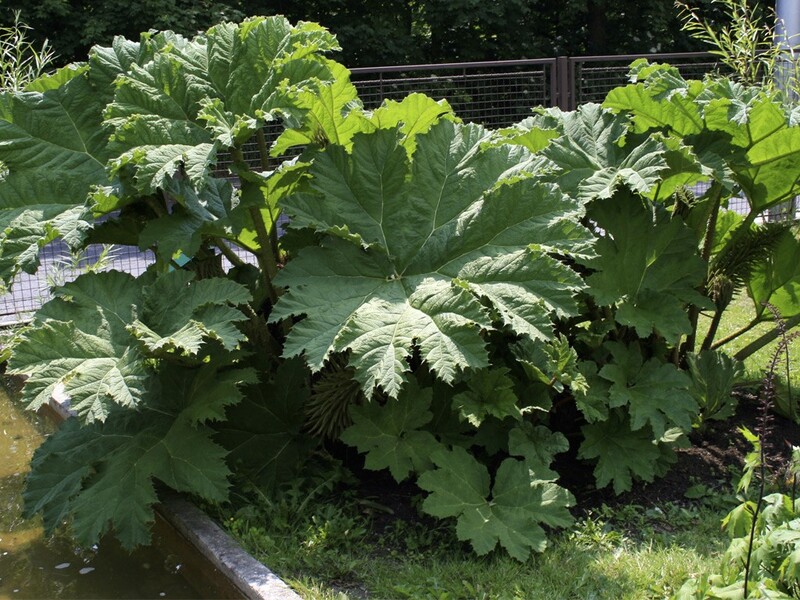 Gunnera tinctoria, known as giant-rhubarb or Chilean rhubarb, is a plant species native to southern Chile and neighbouring zones in Argentina. 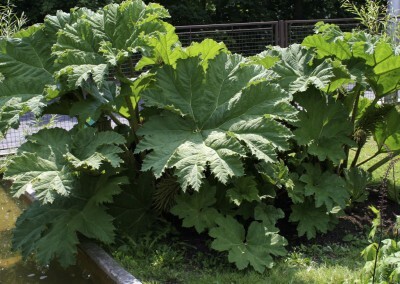 Gunnera is a herbaceous perennial plant that resembles common rhubarb but is much larger (2.5 metres high with leaves 2 metres wide). It has been introduced to many parts of the world as an ornamental and edible plant. In Ireland it has spread from gardens and is becoming a major weed problem, in particular on Achill Island and in Counties Mayo and Galway . 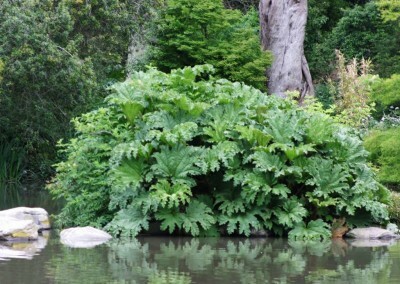 The risk assessment undertaken as part of the Invasive Species Ireland project prioritised Gunnera tinctoria for preparation of an Invasive Species Action Plan. 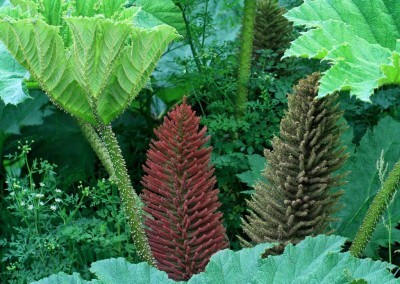 Gunnera tinctoria has negative impacts on the environment, biodiversity, native flora and fauna and landscape character. This species acquired a score of 19 out of a possible 25 from stage 1 of the risk assessment process owing, in part, to its potential impact on protected habitats and species leading to non-compliance with EU legislative obligations under the Water Framework and Habitats Directives. 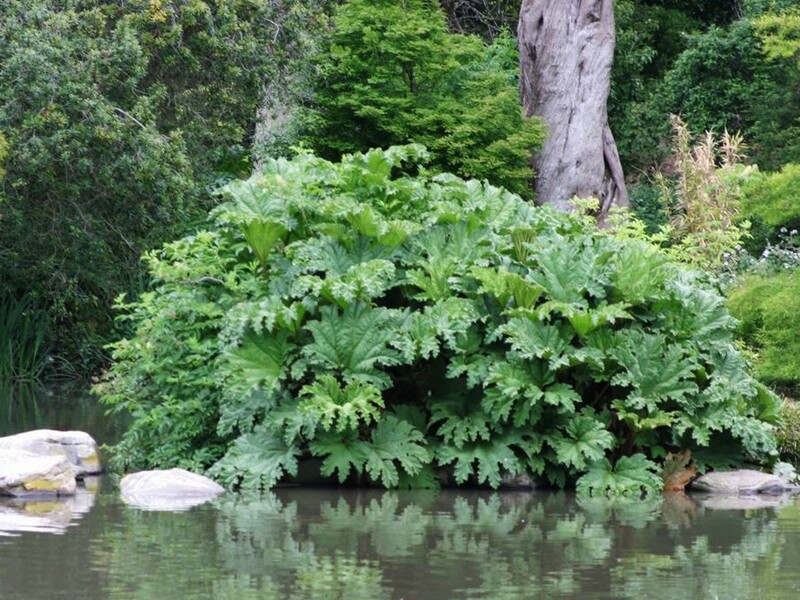 Gunnera tinctoria is a large herbaceous perennial, which can grow up to 2 m tall, with leaves of up to 2 m in diameter. It is a rhizatomous plant with the rhizomes of mature plants up to 1.5-2 m long and commonly growing above ground. It has a spikey stem and produces a large cone-shaped flower head from spring to early summer, with small flowers. The fruit is orange. Each large seed head produces up to 80,000 seeds. Gunnera tinctoria is a deciduous plant whose leaves die back in autumn (October) commonly leaving the large brown rhizomes exposed. Growth starts in early spring (March), prior to the emergence of most native species. It can reproduce by both sexual (seed) and asexual (vegetative) means. Inflorescence development occurs early in the spring, with the fruits maturing in late summer/early autumn. Large numbers (up to 250 000 seeds per mature plant) of drupe like, red or orange seeds are produced. Small fragments of the rhizome have the potential to establish new plants. 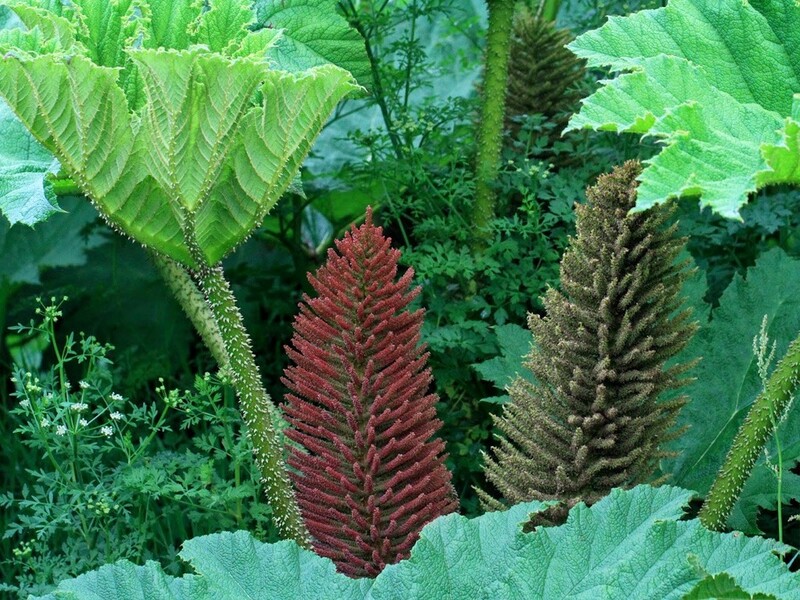 Gunnera tinctoria is a large herbaceous perennial, which can grow up to 2 m tall, with leaves of up to 2 m in diameter with reddish bristles and spines and the inflorescence up to 1.2 m tall. 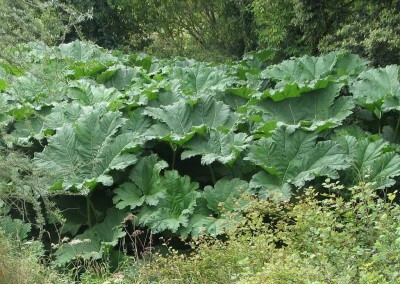 Due to Gunnera’s wide leaf span, large dense stands can have a dramatic impact on the local biodiversity by light exclusion. On rivers it causes erosion to banks, exposing them to fast running water after die-back in winter. When the plant dies back it’s dead leaves fall into watercourses and can block drains and culverts, resulting in flooding. It can also alter the visual aspect of once beautiful landscape vistas, by rapidly colonising large tracts of fallow ground. 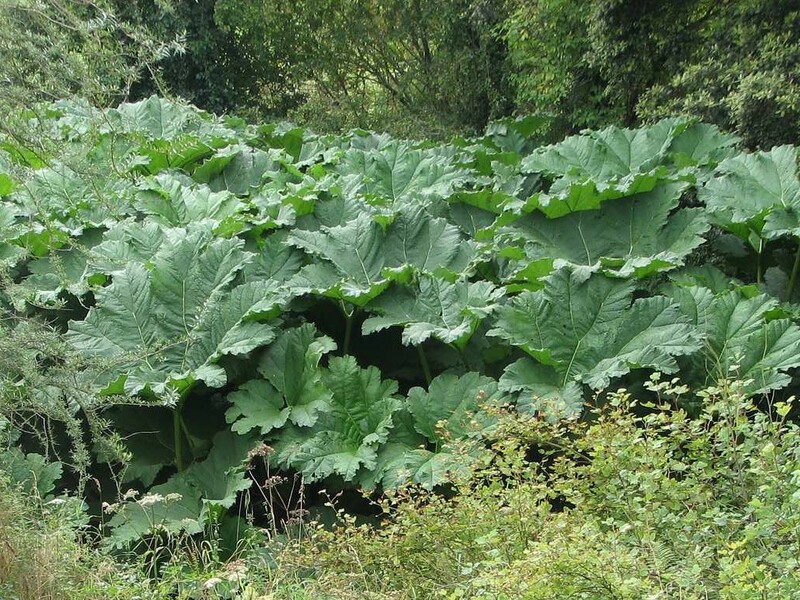 While Gunnera has become a major problem in the west of Ireland, INVAS Biosecurity believes in its mission statement of providing the “first line of defence”, and that preventative eradication programs should be put in place now by those stakeholders whose responsibility it is to protect our environment. This would be extremely cost effective both in the short-term, and save millions in the long-term. INVAS Biosecurity will carry out baseline distribution surveys, risk assessments and develop comprehensive management plans. INVAS Biosecurity staff will also supervise or carry out the work on the ground. Herbicide application at the end of the growing season achieves the best results and is the most cost effective control method. – INVAS Biosecurity uses the most up to date spraying equipment and has at its disposal, vehicle-mounted, quad-mounted and boat-mounted sprayers. – Rhizome injection is a most effective control method on small stands but can be costly on larger areas. – Cut and paint (with concentrated approved herbicide) is also very effective on smaller infestations or for gaining access into large stands in environmentally sensitive areas. All INVAS Biosecurity personnel are certified to apply approved herbicides and will ensure that appropriate Risk Assessments before any herbicide application is carried out. It is important, however, as with all invasive weeds, that a commitment is made to a long-term program over a number of years as, despite the absence of leaf growth, rhizomes can remain viable and regrow over two years after treatment. 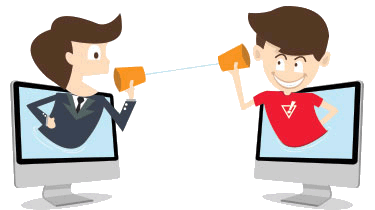 This is why an on-going monitoring and reporting program is an integral part of the INVAS service.